Sergeant Alfred Claude Brenton Sowden, 841889, Royal Corps of Signals, awarded B.E.M. (Military), died on 7 September 1945, aged 27. He is remembered on the Rangoon Memorial in Burma to those with no known grave. Although speaking no French, Sgt. Sowden volunteered to be parachuted into France in civilian clothes and was dropped on the 9th July 1944 as W/T [Wireless / Telegraph] Operator to a mission in the Marne Department. Sowden transmitted daily under most difficult conditions in an area thick with German troops and Gestapo, who were endeavouring to locate his transmitter. On several occasions he was surrounded by strong German W/T posts at a few hundred yards distance. 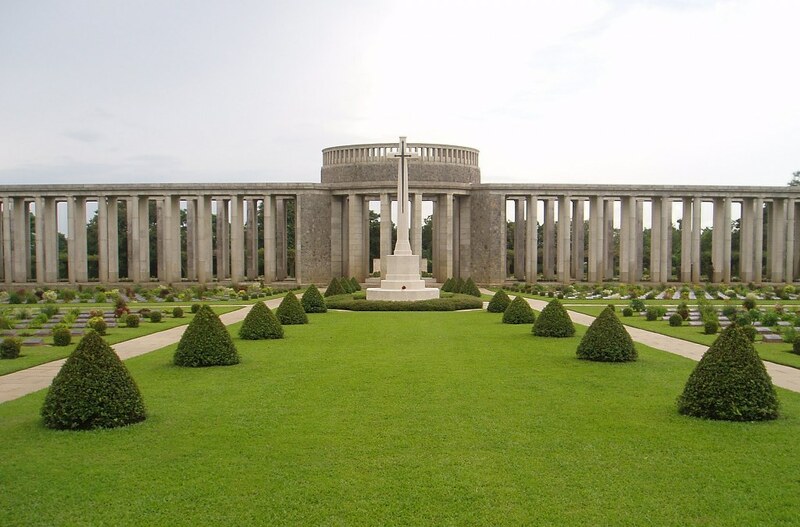 He also worked at only 8 kilometres distance from German supreme HQ at Verzy (Marne). By his technical ability and devotion to duty, the transmission of important intelligence concerning enemy dispositions was made possible. It is strongly recommended that he be awarded the Medal of the Order of The British Empire (Military Division). It appears that after his service in France with F section SOE (Special Operations Executive) as ‘Alfred Claude Saunier’ (cover name) on the Pedlar Circuit as a W/T operator, he was transferred to fight with Force 136 SOE India in the Burma campaign in late 1944 or 1945. He died there on 7 September 1945, shortly after the end of the war on VJ Day August 1945. From 1945, Force 136 SOE had over 70 officers and nearly 12,000 men under arms, mainly from Maymyo to Rangoon (where Sowden is remembered on the Rangoon Memorial). Troops were operating either behind or in amongst the enemy lines. There were 18 to 20 Wireless Telegraph stations in regular communication with Force HQ in Cal­cutta, which sounds like Sowden’s likely involvement. ‘Tip and run’ raids were carried out, forcing the Japanese to divert many troops to protect their supply dumps and lines of communication. 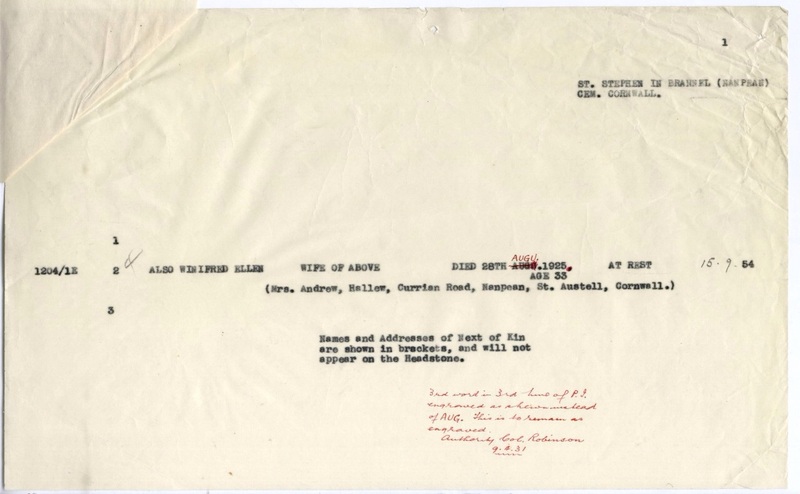 In his probate records 1946 Alfred C B Sowden is listed as living at Killiganoon Farm, Devoran, son of Alfred Sowden, farm foreman / later farm manager (b. St. Eval, 1895 – d. Truro, 1989). His mother Mabel Sowden (born 1895 St. Ervan, died Probus, Truro in 1966) had as her maiden name Brenton, a name being given to her son as one of his middle names. CWGC lists as Additional Information: Husband of the late Winifred Ellen Sowden ( nee Andrew) born who died not long after in c.1925 and appears to be commemorated on the same headstone. Born in 1892, Hallow, St Stephen In Brannel, Cornwall, she died Aug 1925, Hallow, St Stephen In Brannel, Cornwall, Age 33 years. This suggests why Samuel is buried back close to home, rather than his birth parish or near the hospital of his death. An SOE Special Forces Roll of Honour lists A C B Sowden’s birthdate as 12 March 1918, born and resided in Cornwall. Lieutenant John Basil Tallack, 314967, Reconnaissance Corps, Royal Armoured Corps and 49th West Riding Regiment (the ‘Polar Bears’) died aged 20 on 28th November 1944 on active service in Holland. 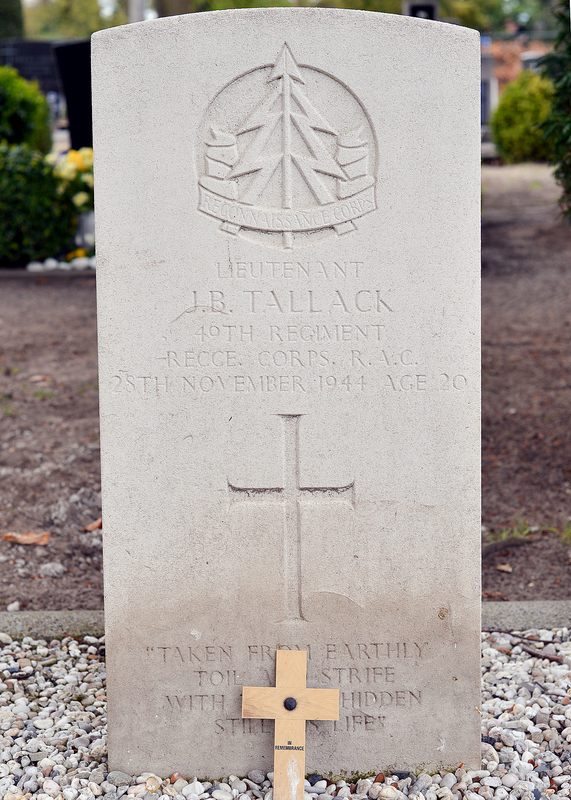 J.B. Tallack’s headstone (Photograph copyright / courtesy of the CWGC / TWGPP War Graves Photographic Project). 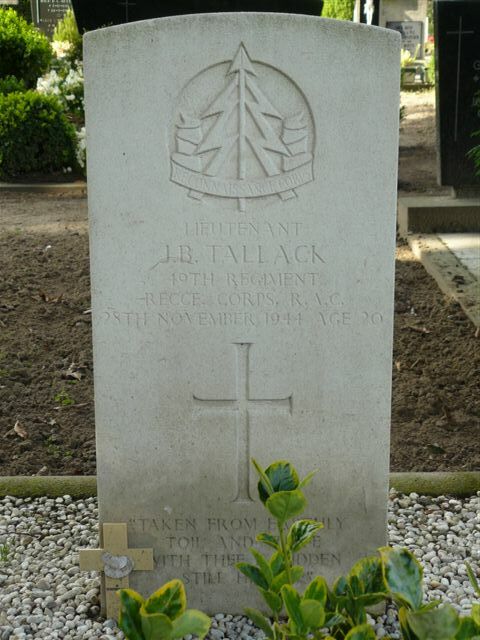 On his CWGC headstone are a poignant choice of words by Tallack’s parents which I think read: “Taken from Earthly Toil and Strife / With Thee Is Hidden Still His LIfe. ” These sound similar to words from a hymn by John Ellerton, a hymn for the departed or burail first published in Hymns for Schools and Bible Classes (Brighton), 1858. 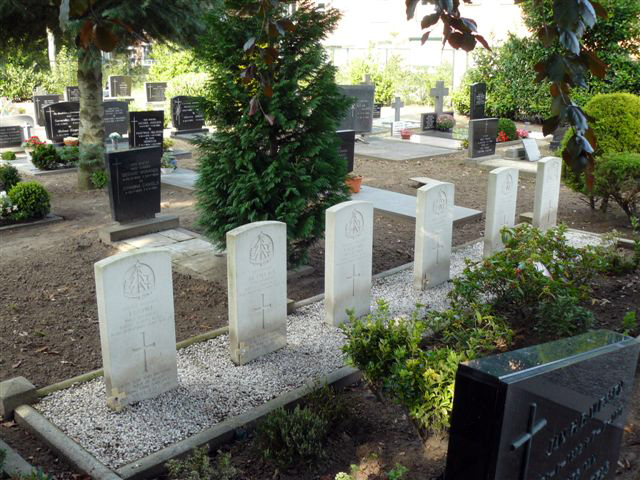 Basil Tallack is buried in Row 2, grave 2 of the Maasbree Roman Catholic Cemetery, Limbourg, Netherlands. He is one of 5 casualties from his regiment and the Reconnaissance Corps in this cemetery from 21st to 29th November 1944. J B Tallack’s headstone with the inscription (Photograph copyright / courtesy of the CWGC / TWGPP War Graves Photographic Project). He is listed on the CWGC website as the son of John and Flora Rebecca Tallack and in his Will / probate records as living at Crofthill, Perranwell Station. A poignant press cutting about J B Tallack’s life and death – unknown newspaper, c/o Tony Dyson 2007 research. His father John Tallack is listed as a water engineer. His mother, Flora Rebecca Tallack (nee Stephens), a farmer’s daughter born in Kea in 1888 was listed in the 1911 census as living at home at Rose Cottage, Kerley, Chacewater. At 23 she was already headmistress of Cornwall Local authority school. (She was following in her sister’s footsteps as Hilda in 1901 was listed as a 15 year old pupil teacher). Flora died in Truro, 1967. The rest of her family of brothers and sisters were in 1901 and 1911 farmers, farmer’s sons, tin miners and the girls dressmakers, milliners. This was the background on his mother’s side of John Basil Tallack’s family. Interestingly, Tallack’s Creek is the name of a section of river or creek between the seaward side of Devoran Quay and Carnon Mine on the way to Point. A picture of a ‘Basil Tallack’ can be seen in the class photo c.1928 in Ralph and Marie Bird’s book Devoran and its River, although the circa date may be slightly vague as he looks a little older than a four year old boy born c. 1924. This may or may not be John Basil Tallack. A faded photocopy of a photo of a visit to Tallack’s original cross, The visitors may be his parents? c/o Tony Dyson 2007 research. A memorial tablet to Lieut. 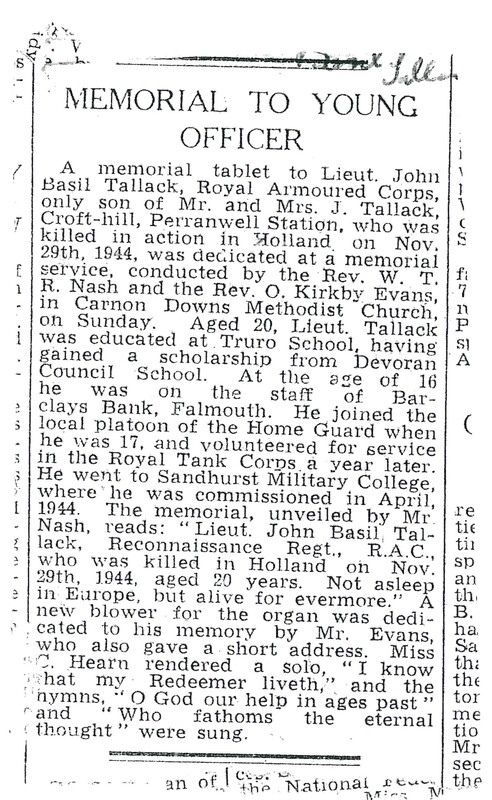 John Basil Tallack, Royal Armoured Corps, only son of Mr and Mrs J. Tallack, Croft-hill, Perranwell Station, who was killed in action in Holland, on Nov. 29th 1944, was dedicated at a memorial service, conducted by the Rev. W.T. Nash and the Rev. O.Kirkby Evans in Carnon Downs Methodist Church on Sunday [no date given]. Aged 20, Lieut. Tallack was educated at Truro School, having gained a scholarship from Devoran Council School. At the age of 16 he was on the staff of Barclay’s Bank Falmouth. He joined the local platoon of the Home Guard when he was 17, and volunteered for service in the Royal Tank Corps a year later. He went to Sandhurst Military College, where he was commissioned in April 1944. The memorial unveiled by Mr. Nash reads “Lieut. 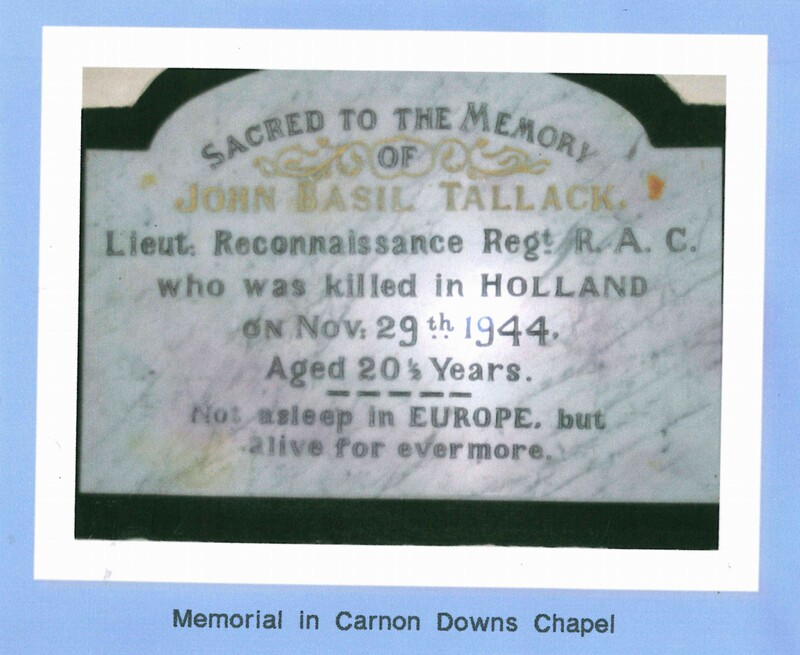 John Basil Tallack, Reconnaissance Regt, R.A.C. Who was killed in Holland on Nov 29th 1944, aged 20 years. Not asleep in Europe but alive for evermore.” A new blower for the organ was dedicated to his memory by Mr. Evans who also gave a short address. Miss C. Hearn rendered a solo “I Know that my Redeemer liveth” and the hymns “O God our help in ages past” and “Who fathoms the eternal thought” were sung. c/o Tony Dyson’s 2007 research. Tony Dyson also notes the background to Tallack’s death. The 4th Armoured Brigade having fought its way eastwards from Normandy [after D-Day] through Belgium entered Holland. 17th September 1944 saw the start of Operation Market Garden, the airborne landings at Arnhem featured in the film “A Bridge Too Far” [see also John Garfield Jeffrey’s death in this battle). During September and October 1944 the 4th Armoured Brigade pushed towards the area west of Eindhoven, reaching by the end of October the area between Tilsburg, Goirle and Breda. On 13th November operations began to clear the enemy from the area west of the River Maas. “John Basil Tallack was the younger brother of my mother, Betty Jory Martin (nee Tallack), 1922 – 2004, a school teacher and well known Methodist local preacher. There were no other siblings. My mother was two years older than Uncle Basil and was at Teacher Training College when he was killed. 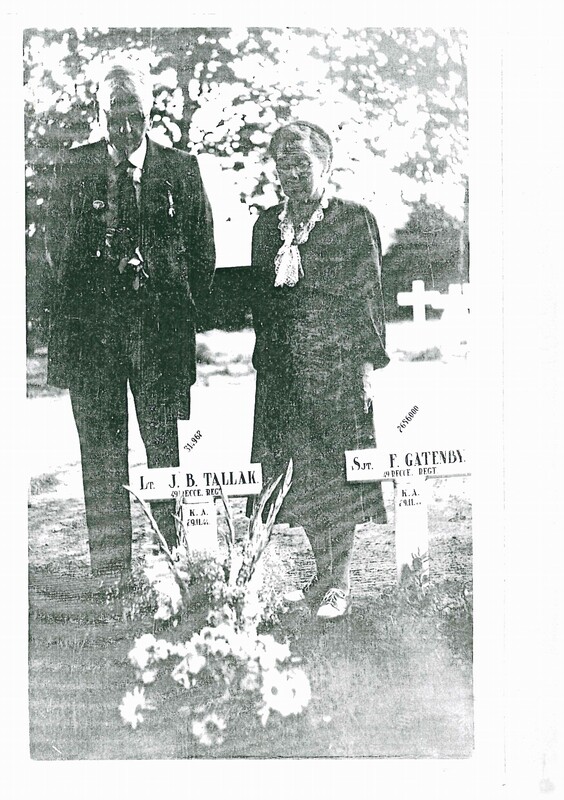 The photograph shows his parents, my grandparents, John & Flora Tallack visiting his grave before the permanent CWGC grave was placed there. I am not sure what year this visit took place. My mother and father, Betty & Henry Martin visited the grave on the 40th anniversary of his death in 1984. I visited the grave in 2004 with my husband, Stuart Phillips and my sons Thomas & Ben. This year Stuart & I will visit the grave with my sisters, Suzanne & Mary Martin. None of us knew Uncle Basil – I was born in 1954 and my sisters in 1957 & 1960. We we never really told how he was killed; I know that my grandparents never really got over the loss of their beloved son. 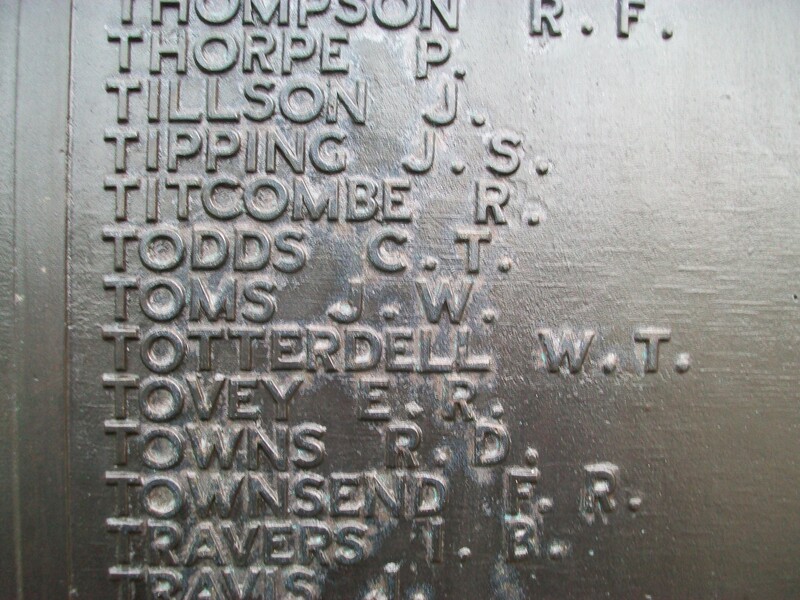 Able Seaman Joseph William Toms, D/SSX17063 Royal Navy, died onboard HMS Galatea on 15 December 1941, aged 23. 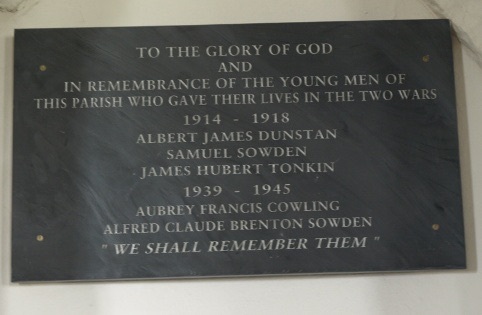 He is commemorated at panel 48, column 3 Plymouth Naval Memorial. He has no known grave. He is listed on the CWGC website as the son of Harry and Mary Toms (1873-1955) and husband of Ruby Louvain Toms (nee Peachey, 1916-1998) of Truro, Cornwall. HMS Galatea was an Arethusa light cruiser built 1933/34 by Scotts of Greenock, Scotland and commissioned on 14 August 1935. It served in the Norway Campaign and Opertion Dynamo at Dunkirk. Damaged by a mine off Sheerness on 7 September 1940, after Dry-docking for repair, Galatea was involved in the hunt for the Bismarck. It served in the Mediterranean Convoys to Malta and Tobruk. HMS Galatea was sunk by torpedoes from German submarine (U boat) U557 off Alexandria in Egypt on 14 December 1941. Toms was amongst the Captain, 22 officers and 447 ratings who died when the ship sank in 3 minutes. Only 100 survivors were picked up. More information can be found on the HMS Galatea memorial website http://www.yourtotalevent.com/events/galatea.htm to the crew with photographs and detailed information on the ship and its sinking. Captain James Ernest Brian Williams, 137305, DCLI Duke of Cornwall’s Light Infantry, seconded to the 4th Battalion Ox and Bucks Light Infantry, was killed in Italy on 28th February 1944. 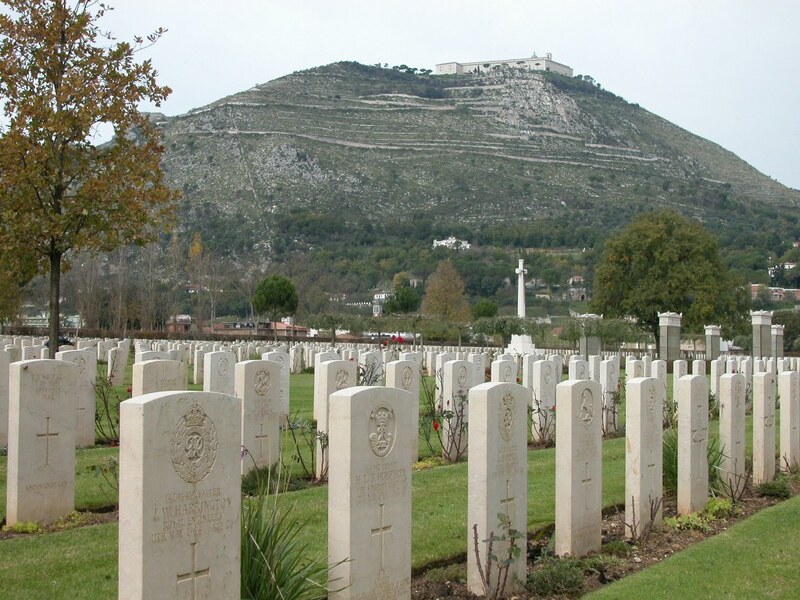 He has no known grave and is commemorated on panel 7 of the Cassino War Memorial, suggesting that he died in the fighting for Monte Cassino. He is listed on the CWGC website and probate records as the son of James Henry Williams (a Ministry of Agriculture official) and Zoe Tresilian Williams of Trenant, Point Green, Devoran. 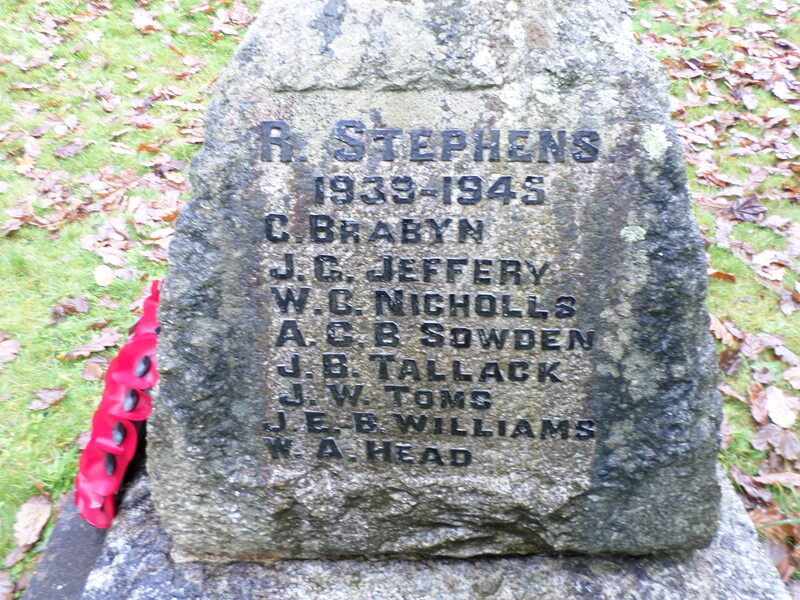 This entry was posted in Cornwall, Devoran, war memorial, WW2 and tagged Arnhem, Cornwall, Devoran, SOE, war memorial, WW2 on August 6, 2013 by worldwarzoogardener1939. John Basil Tallack was the younger brother of my mother, Betty Jory Martin (nee Tallack), 1922 – 2004, a school teacher and well known Methodist local preacher. There were no other siblings. My mother was two years older than Uncle Basil and was at Teacher Training College when he was killed. The photograph shows his parents, my grandparents, John & Flora Tallack visiting his grave before the permanent CWGC grave was placed there. I am not sure what year this visit took place. Tallack’s creek in the Devoran River is named after the same family of Tallack – my great-great grandfather and his forbears lived at Narabo Farm, by the creek. As well as farmers they were lightermen who worked on the boats which sailed up and down the River Fal between Falmouth & the mining areas around St Day & Chacewater. thank you for your additional details of J B Tallack which I will (in the next week or so) copy out of the comments box into the main part of the Devoran War Memorial blog entry for him. There is a possible picture of a Basil Tallack (not sure if the late 1920s circa date is correct) in one of the Devoran school pictures in Ralph and Marie Bird’s book Devoran and its River, which may interest you. Calling him Basil may be the common and a Cornish thing for a son to take his father’s first name but be known by his middle name (taken to the extreme and confusion of the war pensions authorities in the case of F.G.Webb of Devoran killed in WW1). We are trying to put a face to each name on the memorial, so if you have a photograph of him we would love to include it here. I wish you all success in your next visit to his cemetery and the other associated graves from the same fighting, it is good to know that men like Basil Tallack are remembered in their home village and also by their families. If I find out any more about his military career and circumstances surrounding his death I will post this on the blog. Many thanks, Mark Norris, Devoran War Memorial Project. Posted a remembrance online of J.B. Tallack today on his 70th anniversary and also thought about him whilst visiting the Devoran war memorial today. Hope your family visit to his grave in Holland has gone well.